Everyone loves weddings. After all the stress that go with the wedding preparations, couples look forward to spending their momentous day with people that matters to them the most – their friends and family. So what is one of the most exciting part of any wedding celebration? The opening of gifts, of course! Good thing having a wedding registry is common these days. Otherwise, couples still have to dread about receiving the same sets of gifts and guests have to worry about what to give to the couple because they don’t have an idea of what the newlyweds really want or need. Best Buy, the nation’s largest consumer electronics chain, has recently launched its wedding registry, which provides a simpler and exciting way for couples to register for gifts that they actually want and need. Through Best Buy’s Wedding Registry, couples can expect to get the gifts that they really want, including useful things that they can use as they start their life together. What makes Best Buy Wedding Registry unique? Well, there are several reasons why couples everywhere should be excited about it. Best Buy Wedding Registry does not only offer traditional wedding gifts but also popular consumer electronics and small appliances. Silverware and bedding sets are a must for newlyweds but so are the latest electronic gadgets. Going on a romantic getaway for your honeymoon? Well, you will need the latest DSLR or a GoPro HD waterproof camera to capture every special moment – and you can turn to Best Buy for that! The wide range of products to choose from is something that couples should really be excited about. From the handy coffeemaker that you will need every morning to the new gas grill that will be a hit on the barbecue party that you will throw for your friends and neighbors, you can have them all listed on your wedding registry at Best Buy. Free shipping – Guests, including those who will not be able to attend the wedding, can send gifts at no extra cost (at no minimum purchase). Group Gifting – Any item on your registry that is worth $200 or more will be eligible for group gifting. If your guests decide to help you buy one of these items, they just have to click the ‘Contribute’ button and enter the amount they want to give. Best Buy will then send an e-gift card that can be used for that item or for future purchases. I never knew Best Buy had a gift registry! What a brilliant idea - I bet a lot of people sign up! Wish I had known about this before. This is a big help for couples starting out. I never thought about registering at Best Buy, but there are so many things there that would be useful. Glad to know they have it available. I had no idea that Best Buy had a wedding registry. But I guess you can buy the happy couple many things there too! I like the Best Buy registery it takes the guesswork out of gift buying!! This is such a creative list! My husband and I have been married 11 years and have yet to go on a honeymoon! lol We are saving up now though and making plans for a Mom and Dad only trip! This is a great idea — we would have just registered here and skipped the china we never ever use! Great list of things to pack. Since I've already been married I guess I won't be doing this packlist any time soon. I had no idea they did registries! My friends are getting married in a few months... I need to pass this info on! If I could do it over, I'd definitely include Best Buy on my registry list. I need a new camera! These are some really good things to include for your honeymoon trip. 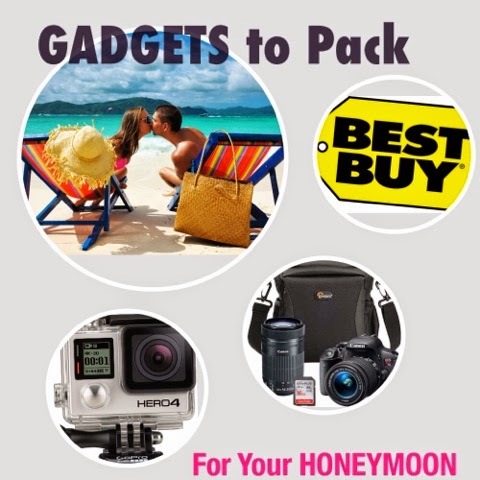 My honeymoon was very busy with just my husband, but these things will come in handy. Having the ability to register at Best Buy is really awesome!! We are planning to have a honeymoon soon, so these tips are handy. thanks! What a great idea. I didn't know Best Buy had a Bridal Registry. Go Pro would really be handy for honeymooners. It would be great for documenting the places you visit and some milestones as a couple. A camera was a must for our honeymoon. I purchased one just before we went on our trip. I'm convinced people would choose their computer or other electronic favorite go-to over many many things, lol. Best Buy makes good sense for a registry. I think every newly married couple should have a solid digital camera. You need something to create long-lasting memories of all the adventures you have together. great list! My hubby and I need to go on another honeymoon, since we never actually took one before. Thanks for the tips! Ill keep it in mind! Had no idea that Best Buy had a wedding registry. Love that they have free shipping! I can come up with a huge list of things I would love (and need) from Best Buy. Having a good camera is definitely a must. It will be useful in documenting all the precious memories that will be made during this special time. Great wedding gift idea! I always think about home needs, but newlyweds definitely need their electronics. I'll recommend the gift registry to my sis.